One particularly good low-cost way to escape the “same old, same old” of modern life is to dig out a box of food coloring from the recesses of your kitchen cabinet. Most people have a box of the stuff somewhere, but it’s usually only used to color cookie frosting around the holidays. Rather than sitting forgotten in a pantry, we believe its rightful place might be right next to the salt and pepper shakers that get used every day. I fell in love with the stuff during my first ever attempt at the Escape Plan. I made myself some green eggs (thanks for the inspiration, Dr. Seuss! 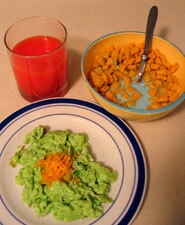 ), red orange juice, and enjoyed Capn Crunch in some blue milk. I can’t think of anything that made me feel like a five-year-old faster than mixing in a few green drops to the eggs I was whisking. Kids love stuff like that, and your inner child still does, too! Some people get weirded out by food that comes in strange colors, but considering that the taste is left unchanged, we think that any apprehension might just be Adultitis talking. 1) Celebrate holidays. Think green yogurt smoothies for St. Patrick’s Day, pink pancakes for Valentine’s Day, or orange eggs for Halloween. 2) Dye white food. You haven’t lived until you’ve had blue mashed potatoes or green cottage cheese. 3) Make Ugly Cakes. Food coloring has traditionally been used in cake decorating. But who says your creations have to be pretty? Some friends of ours have a tradition of trying to make their cakes as ugly as possible. Check it out and let your creativity run wild! 4) Brighten Your Day. On particularly grey wniter days, Kim likes to brighten up her workspace by adding a few drops of food coloring to glasses of water lined up by her window. 7) Paint the Snow. Still have snow on the ground? Do some snow painting with spray bottles filled with water and a touch of food coloring. Use food coloring to tint the egg mixtures in each bowl. Add cheese, cook, flip and serve. 10) Pyschedelic Milk. Science dude Steve Spangler has a neat experiment you can try involving milk, food coloring, and some dish soap. In a coffee cup, mix about 20 drops of food coloring with 1 teaspoon of vinegar. Add 1/2 cup hot water. Before you color your eggs let the water cool to room temperature. If necessary you can add a bit more water. You want the coloring to completely cover the egg when put in the cup. Repeat the steps above to make different colors. Gently lower eggs in the cup. The longer you leave the eggs in the dye, the darker the colors will be. Once the egg reaches the desired color, remove from the cup with a spoon and pat dry with a paper towel. Hint: Wipe with vegetable oil (with paper towel or a rag) to make a glossier egg. For a tie dye effect, wrap rubber bands around the eggs before dying. Write your name or draw a picture on your eggs using light colored crayons and then dye as usual. Place shaped stickers on your eggs before dying! Cut small strips of masking tape and stick on eggs before dying. 12) Mix It Up and Taste the Rainbow. Of course, you can always mix your colors to make new ones. You probably know that yellow and red make orange, while blue and red make purple. But what about black, which is extra handy for Halloween? Just mix 3 parts red, 3 parts blue, and 2 parts green! cool i wish i could do the purple hair!! Hi Kim & Jason. I just found your site and I love it. I love this article and want to try some of your suggestions. I really want to try the Omelette Art. But I’m not so sure about the blue milk. I’ve done green milk at St. Patrick’s Day and I swear it tastes icky! I also love Steve Spangler and have spent lots of time getting ideas off his site. 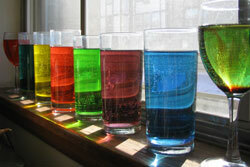 Have you seen this one – http://www.stevespanglerscience.com/experiment/00000035 – you make a lava lamp with cooking oil, water and food coloring. Keep letting that childlike spirit shine! Hi Kelly! I’m not sure if you’ve had a chance to see it yet, but Kim and I posted an article on our blog inspired by your request. I hope it gives you some good ideas for your apartment — let us know how it goes. Thanks again for the idea! I love your site! I am a Preschool Director in a rural Centre in south Australia and introduced ‘adultitis’ awareness in2010. Your ideas and suggestions are brilliant and just what we need to boost parent morale at times. I am also a teacher as well and love to approach learning from a play based curriculum so when I checked out your site today I was ‘delighted’ to find see your suggestions about food colouring. I too was inspired by Dr Seuss many years ago and Green Eggs and Ham are a regular part of our preschool year as well as Leprechaun Fizz etc for St Patrick’s day. I use this as an experiment with children to utilise all their senses as we try and pick the different taste of pineapple and orange/mango juice when it is coloured green. The fizz is just soda water to add a bit more chemistry! But the results are fantastic especially when we get the parents involved and the children are a little heavy handed with the food colouring….green tongues everywhere :) Crazy hair day is just around the corner (cancer fund raiser) usually we have spray cans of colour but I think I might try the food colouring in mine and see what happens…..thanks and keep doing what you guys do best …PLAY…love it!!!! Jacky, thanks for the super comment! Nothing beats green tongues. It’s so exciting to hear about Adultitis awareness making it around the world! And it really sounds like those students (and parents) are quite lucky to have you. Kim and I would love to visit Australia someday; it looks so beautiful. Perhaps there will be an opportunity one day to speak at some sort of early childhood association conference of some sort — never know! Ah, but you can! Check the link in the post above! Mom will HATE IT, but six years ago I needed a double transplant and wanted my hair purple when I went into surgery, but you don’t really get too much warning when your waiting for an organ! I’m great now!!! I thank my inner child for that! Spongebob has the right idea. Happy to go to work, refers to Squidward as his friend even though Squid hates him, and ALWAYS looks for the fun in life! (F Is for friends that do stuff together…Sorry, I digress! We all need to hang out at the kids table more often! ( Personally, I always do!). Thank you guys for the smile!!! Here’s to purple hair! So glad you found us, and so glad to hear you passed through an organ transplant with flying colors!